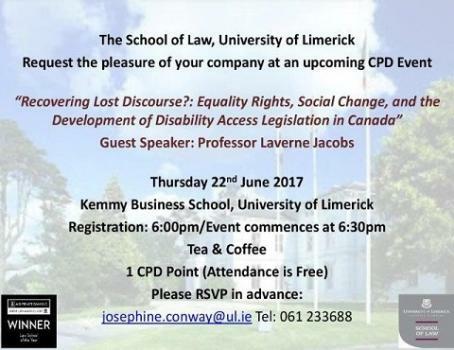 The School of Law at the University of Limerick is delighted to welcome guest speaker Professor Laverne Jacobs on Thursday 22nd June. Professor Jacobs is a Fulbright Scholar and a renowned researcher in the field of disability rights. She will deliver a paper entitled “Recovering Lost Discourse? : Equality Rights, Social Change, and the Development of Disability Access Legislation in Canada”.